Asperger’s syndrome is a kind of pervasive developmental disorder, or PDD. A PDD combines a number of symptoms and conditions that result in the delaying of the development of normal human skills. Largely, the skills affected are social skills, and the ability to communicate with others. Asperger’s manifests in lots of different ways, and not everyone will display exactly the same symptoms. Of course, it will involve the delaying of some skills, but some people might experience severe delays of one skill and no delays of another. Technically, Asperger’s is a part of the autism spectrum, and a child diagnosed with Asperger’s will do better at school than a child diagnosed with autism. If you have a child that has some developmental problems, or you think that some of your behaviour could be the result of a condition, be sure to check out the following common symptoms of Asperger’s. If you do have the condition, you might experience a few of these symptoms but not the others. Generally just one symptom will not be a good enough sign that you have the condition, but if you tick a few of the following boxes, it might be worth considering that you have Asperger’s – and, if you have serious concerns, you should speak to your doctor. If you or your loved one has difficulty making friends from a young age, then it’s possible that Asperger’s is playing a part in this problem. This is the classic symptom of Asperger’s, as it stops a person from connecting with their peers by delaying the development of social skills. Someone with Asperger’s will find it particularly difficult to maintain conversation or participate in group activity at school and in social situations. Motor skills can also be affected by Asperger’s. Some people who have the condition will find it difficult to do things that require precision, like writing in neat handwriting, sewing, etc. This will be noticeable throughout childhood, as hand-eye coordination is learned quite quickly. However, you should be aware that poor motor skills doesn’t necessarily mean you have Asperger’s, it is merely one of many symptoms. Bizarrely, people with Asperger’s will experience delayed development of things like motor skills, but can be excellent at recognizing patterns when given a mathematical formula or anything similar. Studies have shown that people with Asperger’s are naturally good at this in many cases, as their brains are constantly doing more to make sense of their surroundings. This is often noticeable in early childhood, when children with Asperger’s excel in things like art and mathematics, but struggle writing. This is both a symptom of autism and Asperger’s, and it involves people taking theoretical things literally. For instance, people with Apserger’s will often not understand sarcasm, and will instead think that what is being said is absolute truth. However, this does not mean that people with Asperger’s do not understand humor. It simply means that many comments will be taken literally during conversation. Many people with Asperger’s love routine and don’t like straying from it. This can easily be seen during youth, when a child might be more likely to get up at exactly one time, have breakfast at the same time, and have the same routine when they come home from school too. The routine is thought to be a way of coping with anxiety, which is another symptom of Asperger’s. This is extremely common for people with Asperger’s. A person will take an extreme interest in one or two things, and not really spend much time doing anything else. For instance, if someone with Asperger’s really likes video games, then it can quickly take over their life. The same is true for reading, playing or sport, or any other activity. This is because focusing on this activity acts as a comfort, and when they are not allowed to focus on what they love, they become uncomfortable. People with Asperger’s are often able to empathise and understand, but they may find it difficult when they are in public and surrounded by other people. While a person with Asperger’s may look fine, they may be extremely anxious about being in a crowded space or surrounded by lots of people in a public space. It is common in children who have Asperger’s that they may selectively stay silent. This symptom occurs in a way that allows them to speak openly with people that they know and trust, whether they are a teacher, family or a friend – but in the company of strangers, they may not talk at all. This condition will often go away on its own, with many adults with Asperger’s overcoming this shyness over time. However, in some cases, it can last as a person gets older, and can be treated through therapy. 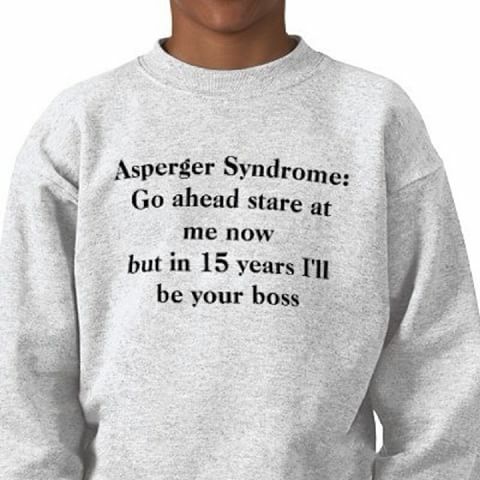 This is not a sure symptom of everyone with Asperger’s, but it is not uncommon. Unlike full autism, Asperger’s often leads people to have difficulty empathizing with other people. It will not be completely impossible, but an immediate response will often include a lack of empathy. They might say the right things and look as if they understand, but in many circumstances, the individual will not be able to empathize at all. Eye contact is something we all take for granted, and something we do when we engage in conversation. However, if you find you have difficulty making eye contact with people, it could be a result of Asperger’s. Many people with the condition will find it uncomfortable to connect on such a personal level, however, this might go away as the individual gets older.